Large, light package arrived at our New York office via Electronic Arts today. 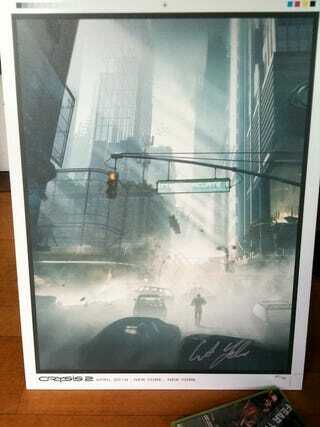 It contained a limited-edition (destined for charity) Crysis 2 art printed on aluminum. You could slice someone with this thing. In the past two weeks, two people, Crysis 2 creative chief Cevat Yerli, and now whoever at EA wrote the letter that accompanied this artwork have described the "catastrophic beauty" of the upcoming game. You know, the game is set in a near-future New York that is being attacked. The city, so they've said, is crying. "Catastrophic beauty" the Crysis 2 people say. As I told Yerli a couple of weeks ago, that sure sounds like "destroyed beauty" of Epic Games' Gears of War. Way to steal a talking point from one of your other EA Partners, people. P.S. Alternate headline for this story: Today, At Least One Video Game Is Art. Because of this, of course.